ANYTHING may be worn on the red "brag vest." Anything up to the Scout and of course his parents. So Order of the Arrow lodge, section, conclave and National OA Conference (NOAC) patches may indeed be worn anywhere on the vest. There is absolutely NO POLICY (written or otherwise) on what could or could not be worn on the red vest. 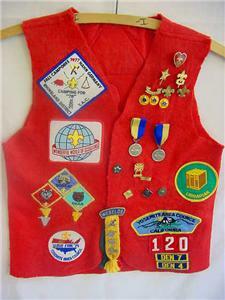 Likewise, if a Scout or Scouter is wearing a non-BSA vest or jacket, anything may be worn on it as well. I remember seeing that one can wear something on the OA sash. I understand about the sashbacks, but can an OA Conclave or NOAC patch be worn there? OA Conclave and NOAC (National Order of the Arrow Conference) emblems are not to be worn on a sash -- they are temporary pieces of insignia. There's only TWO of the following three patches which can be placed on the front side of the sash: the three anniversary patches (the 50th, 60th and Centennial Anniversary Emblems) made specifically for the OA sash. 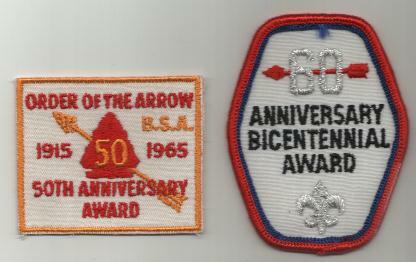 The 50th (above left) and the 60th (above right) Anniversary sash emblems and the Centennial Service Award emblem; these emblems are worn above or below the red Arrow (or above and below the red bar) on the front of the Order of the Arrow sash. Only up to two may be worn at any time. If two are worn, one goes above the top bar of the Brotherhood or Vigil Honor sash (or above the tip of the Arrow of the Ordeal sash) and the other goes below the bottom bar of the Brotherhood sash (or below the bottom tip of the feathers of the Ordeal sash). If only one was earned, the emblem is worn above the top bar of the Brotherhood or Vigil Honor sash or above the tip of the Arrow on the Ordeal sash.